As soon as word arrived at GBW HQ in September last year from Rogue’s importer, Phoenix Beers, that John Maier was planning to head to Melbourne for Good Beer Week, the third Masterclass collaboration event wrote itself. Who else from the Melbourne scene would you pair the brewer behind beers as colourful and varied as Dead Guy, Voodoo and Beard Beer with aside from Abbotsford crazies Moon Dog? That Phoenix distributed the latter’s beers too made things easier still. Thus it was that, following in the footsteps of Moylan’s and Nogne O at Hargreaves Hill (2012) and Brooklyn at Mountain Goat (2013), on the opening morning of the festival 30 guests rolled in to Moon Dog’s brewery for breakfast and a brew day (complete with a trip later in the day, via hot pink pole-dancing bus, to Rockwell & Sons for a lunch at which we were lucky enough to enjoy the rather meta moment of drinking Beard Beer with the beard from which its yeast was sourced mere inches from our glass). The beer the two breweries had conceived was as out there as one might imagine: a smoky barley wine that would feature Crystal hops grown on Rogue’s own hop farm and was to be aged in three different types of barrel that had previously been used to made Rogue’s whisky, rum and gin. A four-pack would then be released featuring the “naked” original and each of the three aged versions. 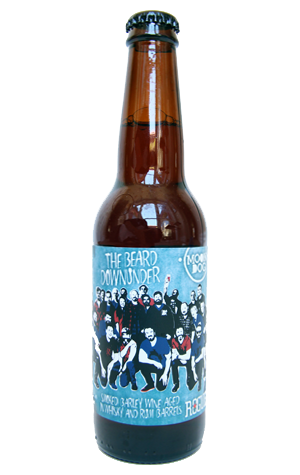 In the end, the gin barrels and barley wine didn’t make for happy bedfellows and there wasn’t a huge amount of the “naked” beer so the Moon Doggers decided to instead blend the whisky and rum barrel versions to create one beer: The Beard Down Under, with labels featuring a photo of the entire Masterclass crew taken by Jess Shaver as the pole dancing bus pulled up outside the brewery. You’re met by a big, juicy cherrywood aroma atop a suitably dense, sweet, spicy, fortified, fruity and boozy beer that should enjoy a spot of cellaring.